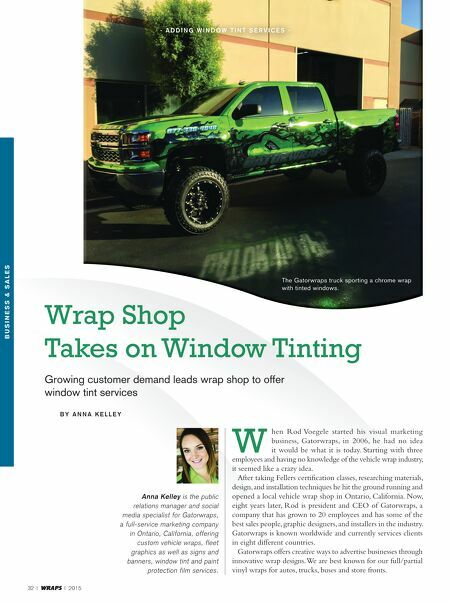 32 I WRAPS I 2015 Wrap Shop Takes on Window Tinting - A d d i n g W i n d o W T i n T S e r v i c e S - Growing customer demand leads wrap shop to offer window tint services B y A n n A K e l l e y Anna Kelley is the public relations manager and social media specialist for Gatorwraps, a full-service marketing company in Ontario, California, offering custom vehicle wraps, fleet graphics as well as signs and banners, window tint and paint protection film services. W hen Rod Voegele started his visual marketing business, Gatorwraps, in 2006, he had no idea it would be what it is today. Starting with three employees and having no knowledge of the vehicle wrap industry, it seemed like a crazy idea. After taking Fellers certification classes, researching materials, design, and installation techniques he hit the ground running and opened a local vehicle wrap shop in Ontario, California. Now, eight years later, Rod is president and CEO of Gatorwraps, a company that has grown to 20 employees and has some of the best sales people, graphic designers, and installers in the industry. Gatorwraps is known worldwide and currently services clients in eight different countries. 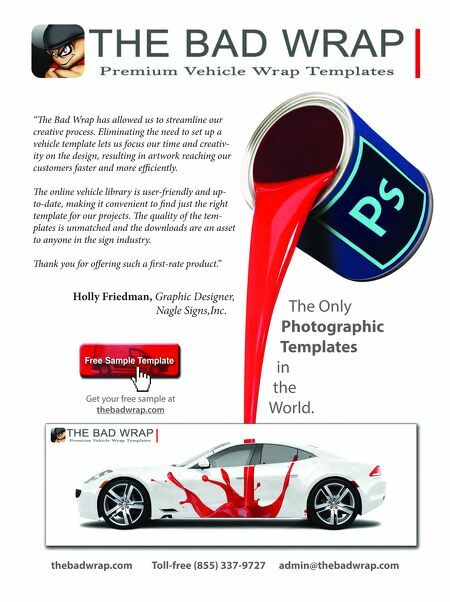 Gatorwraps offers creative ways to advertise businesses through innovative wrap designs. We are best known for our full/partial vinyl wraps for autos, trucks, buses and store fronts. B u s i n e s s & s a l e s The Gatorwraps truck sporting a chrome wrap with tinted windows.